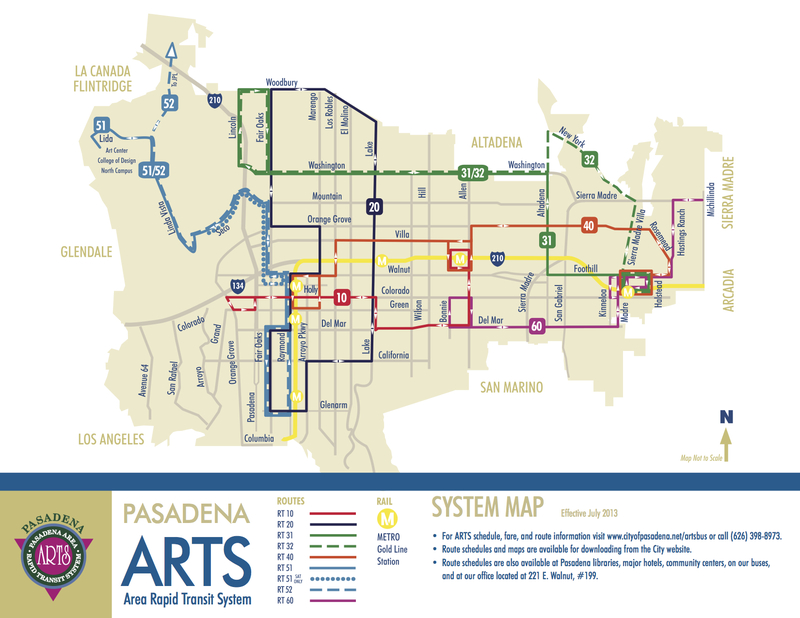 Some good news: TAP cards can now be used on the Pasadena ARTS bus. This is the twelfth transit agency to join TAP with more on the way soon. The ARTS bus will continue to accept cash fares. Board a Pasadena ARTS bus with TAP Stored Value or an EZ transit pass, which can be purchased at one of nearly 400 TAP sales outlets, at taptogo.net or by calling 866.TAPTOGO. Other agencies that accept TAP include: Antelope Valley Transit Authority, Culver City, Foothill, Gardena, Long Beach, Los Angeles Department of Transportation, Montebello, Norwalk, Santa Clarita, and Torrance Transit (line 4 only). For more information about the ARTS bus, please click here. The bus system map is below. Further, if ARTS accepts stored value, how will that figure into the included transfers once that takes effect? Will I be able to transfer from Metro to ARTS within 2 hours? What about ARTS to Metro? The free transfers are only applicable to Metro, so a Metro to Muni transfer would need to be deducted before hopping on an ARTS bus unless you have an EZ Transit Pass. I don’t quite get how the fares work. 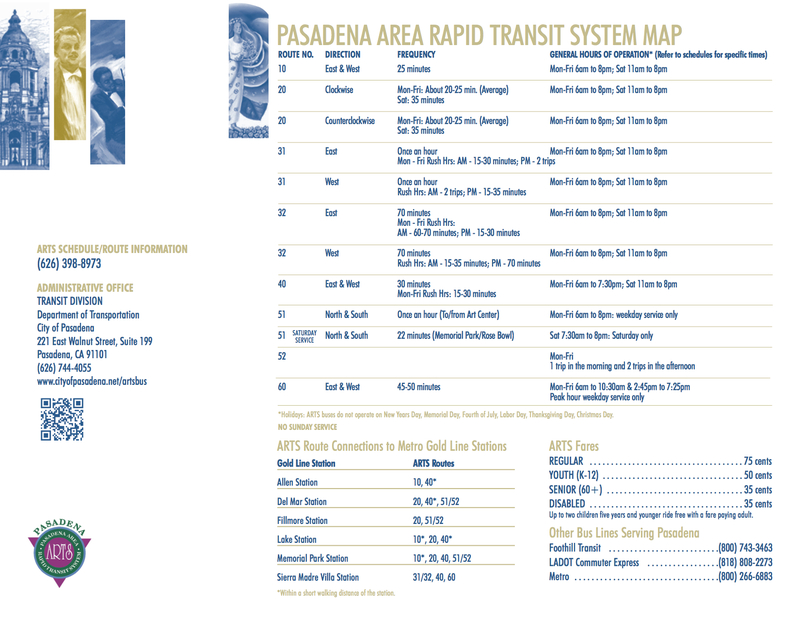 If they accept the TAP card now, does that mean if I have a day pass and I am coming from one of the Metro stations, that I can board any of the buses on any of the routes of the Pasadena ARTS system without paying an additional fare? No. The Metro Day Pass is a Pass only on Metro-operated routes. The Metro Day Pass is only applicable on Metro Bus and Rail. If you transfer to an ARTS bus, you will need to pay the Metro to Muni transfer which is currently $.35 and will be $.50 starting September 15. Yes… But you need to buy the Metro to Muni transfer when you board the Metro vehicle (bus or train), at which point you may not be certain whether you’ll continue your journey with ARTS. Why doesn’t just everyone just come to terms and agree on a single universal fare system!? Why does everything have to be so confusing just to go someplace here!? Riding a bus or train in Hong Kong is so easy even a five year old kid can do it all by themselves. Everyone is on the same Octopus Card system, you can even use the card to buy things at the convenience stores and the vending machines. Everyone tap, tap, tap, tap everywhere they go whether you ride the subway, the buses, the cable car, funicular, even the ferries! LA is so backward and so technologically behind it’s not even funny. Fare structure and smart card technology are two separate issues. L.A. County has a Byzantine system of agencies and fare structures because individual municipalities feel they are not served well by Metro, so they want to maintain local control over transit. And given the complicated fare structure, programming it all into a smart card is very difficult. I hope they’ll get around to it some day, but it’s not a simple task. I was admonished by an Arts Bus driver when I tapped my card that it only accepted EZ Pass and did not deduct value per ride… then I paid the fare. Was I charged twice? Please contact TAP customer services with your TAP card number ready so they can look into this incident. You can reach them at CustomerService@taptogo.net or at 866.TAPTOGO. The problem is that NY is a lot smaller than LA so what works in NY is not going to work here. NY Metro only covers NYC and that’s only 468.9 square miles. LA Metro has to cover all of LA County which spans over 4700 square miles, so that’s 10 times larger than what NY Metro has to cover. And some LA Metro lines expands out to neighboring counties like Ventura County (Metro Bus Line 161) and Orange County (Metro Bus 460) and there’s talks about extending the Gold Line all the way to San Bernardino County. In my opinion, it’s ridiculous to even continue using the flat rate fare system here in LA even with free transfers considering how big LA is. It makes no sense at all to have a fare system where it going from Santa Monica to Pasadena costs the same price as going from Koreatown to DTLA, transfers or no transfers. What works in smaller cities, where prices remain constant with free transfers as in the case as NYC and San Francisco is not going to work in LA. What LA needs is to model transit after cities that have the same characteristics as us. Big metropolitan cities with a huge population spread out over a wide area. There are only few cities in the world that fit this same description: London, Tokyo, and Seoul. What they use are variable based fares, similar to what’s used in Washington DC. Besides, NYC keeps raising their fares all the time. That’s hardly an ideal system. That’s the last thing we need, fares that keep going up, up and up every one or two years that sooner or later it costs $5.00 per ride regardless you go less than a few miles to the neighborhood supermarket or over 20 miles to go to the beach. No thanks, you can keep your NY style system. We don’t want that here. You are confusing two different issues: fare card and fare system are two different things. LA County does have an universal fare card – it’s called TAP. Some agencies (like Santa Monica) choose not to accept it but that’s their choice (but for good reason, which I will explain below). The problem here is not a lack of an universal fare card, but lack of a unified fare system. ARTS (like other municipal agencies) is not on Metro’s fare system so using TAP card doesn’t change anything… you lose all the convenience of having an universal fare card – things like free transfers. To really explain this, will require a Venn diagram and rudimentary understanding of programming. Basically, in LA County, you have 30+ different fare systems so TAP has to program 30+ different “fare buckets”. And when you move from “Metro fare bucket” to “ARTS fare bucket” (i.e. getting from Metro Gold Line to ARTS bus) you end up losing the fare characteristic (e.g. Metro’s free transfers) programed in the first “fare bucket”. The solution is to move everyone into the same “fare bucket”. You can charge different fares but you need to stay in the same “fare bucket”. However, TAP was not implemented that way and all the money deducted from your TAP account to “Metro fare bucket” goes to Metro, not to the actual bus/rail line you tap in. So the other municipal agencies are demanding their own “fare buckets” on TAP as a condition of accepting the card. And thus, this legacy problem of Metro vs. Muni fare system doesn’t get solved but in fact is imported wholesale into the TAP universe. Hong Kong (and many other cities) have multiple transit agencies and operators but they’ve all been able to agree on a single fare system. It’s time for Metro and the municipal agencies in LA County to do the same. While I agree everyone needs to work together, but having different fare systems or “buckets” is hardly an excuse that it can’t be done. Within California, you have the Clipper Card system being used up in San Francisco and their neighboring areas. The Clipper Card is capable of running distance based fares which is the fare system used by BART and Caltrain, as well as flat rate fares with free transfers which is used by SF MUNI. It can also be used on San Jose’s VTA as well as Bay Area ferries. The Bay Area has the same issues as LA where they have to use one single card among different agencies with different fare systems, so why can they figure it out but not LA? Why do we have a half-baked system where TAP is “sorta-kinda” accepted on Metrolink (issued a TAP capable paper ticket, but you can’t use a TAP card to board Metrolink) but not 100% compatible? It’s clearly possible, the Clipper Card is made by the same manufacturer as our TAP cards, it all runs on the Cubic System. You can ride BART or Caltrain and onto MUNI and vice-versa with one single card, so why can’t that be replicated here? Clearly other cities around the world can work to get their act together, overcoming different fare structures and fare systems, while using one uniform payment card. It’s LA and it’s mess of 88 different municipalities that all want to do things their own way that has this problem of not getting things done. list goes on and on with ifs and buts and gotchas.